**Warning: Will only contain spoilers if you have not read Across The Universe." Summary: "Godspeed was fueled by lies. Now it is ruled by chaos. In book two of the Across the Universe trilogy, New York Times bestselling author Beth Revis mesmerizes us again with a brilliantly crafted mystery filled with action, suspense, romance, and deep philosophical questions. And this time it all builds to one mind-bending conclusion: They have to get off this ship." First line: "Elder: 'This isn't going to be easy,' I mutter, staring at the solid metal door that leads to the Engine Room on the Shipper Level of Godspeed." A Million Suns takes off roughly three months after Across The Universe ends. Elder is now Eldest, but still prefers to be called Elder. If you thought he had problems in Across The Universe, you haven't seen anything yet. As you remember from the ending of the first book, Elder took all the ship's passengers off Phydus, however, there's still the mystery of whether or not he'll go against his beliefs in order to keep peace on the ship. You see, dear friends, when people have the freedom to think, their minds begin to wander. Think about how you'd feel if you spent your whole life on a spaceship knowing that's it. There isn't life for you beyond those confined walls. Now multiply that by the hundreds, possibly thousands, and you'll have an idea of what Elder has to deal with. Of course he has other LARGER problems to worry about (one being Amy), but really, you have to read the book to see for yourself. Now, Amy. Being as she was the only one not born on the ship and looks completely different from everyone else, she is automatically labeled a freak. She has to be careful not to expose herself or else she could get hurt. Then, a mystery lands right in Amy's lap where uncovering it could be the key to finding freedom beyond Godspeed. Out of both characters, I have to say that my personal favorite is Elder. I mean, the poor kid gets thrown into running the ship during the worst time ever, and yet he still has the guts to stand up for what he believes in. Most people would crap in their pants and at times, maybe he almost does, but overall, he's a great leader. I felt more invested in his story's than Amy's. He developed more as a character, and I really appreciated that. The romance and tension between the two is hotter than ever. There were moments where I wanted to throw the book against the wall due to my frustrations at Amy. I understand why she doesn't want to have a relationship with Eler, but COME ON! Girlfriend, you obviously have feelings for him. Life's too short, so go for it! Though it's tense between the two, the chemistry still leaps through the pages, taking hold and never letting you go. Sure it's not perfect. It'll make you smile one minute and angry the next, but at least it's grand! It's really hard for me to write this review of A Million Suns. Each chapter unfolds a new, more dangerous mystery, and thus containing small spoilers all leading towards a very shocking ending. What I will say is please be sure to have enough time to read this in one sitting. It's addicting and if you don't finish it the same day/night you started it, you'll regret it. Believe me, even after I finish it, spent the entire next day thinking about everything that happened and what might happen next. It's one of those books you don't just read, but live and breathe in. I cannot recommend this book enough. Fair warning: Once you finish it, any other book will hardly compare. Really, it's that epic. Needless to say, I can't wait to read the third and (*tear*) final book. While I don't want this amazing trilogy to be over, I need to know what happens next, and how it will all end. I NEED IT, BETH! AHHHHH!!!! Umm, that was awkward. Just read the book. That is all. I still haven't read the first book yet so I only skimmed your review--but "holy cow it's good" makes me want to pick up the first one soon! I love love love love your review! (that is one of my favorite graphics!)? Your review has me even more anxious to go pick up my pre-order copy! I love that elder is still called Elder! I just love him. Hehe - you need to do a picture reenactment for all your reviews now. I'm glad the second book help up but I still think I'm going to wait until the series is complete to dive in. I have Across the Universe on the shelf already. 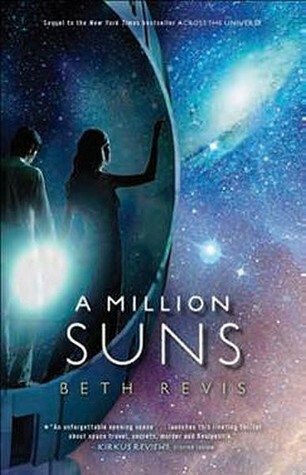 A Million Suns is a book you must read after having read Across the Universe. It really is. You cannot miss this sequel. But yeah. The ending is cruel. Can't believe I have survived a whole year waiting for the sequel. But now it's almost here! Please let me get it in a few days. I need to read it right away. So, so excited.